Collected for their historical hunting significance, interest and general beauty, antique duck decoys have aficionados around the country. Shows, conventions and auctions across the U.S. are dedicated solely to this art, and hundreds of thousands of dollars are changing hands. Whether produced by a factory with exquisite, realistic details or by a carver who just needed a hunting tool a hundred years ago, a duck decoy may be worth a lot of money to the right collector. Since some of these pieces do not have identifiable markings, learning to recognize a true vintage from a modern decoy can take years of learning from the experts. There are some key features to look for that a novice collector can learn to spot. Handle the duck decoy for careful inspection. Vintage decoys will look and feel old. The paint and wood will have a consistent, overall wear pattern. The decoy may even have bullet holes. If the decoy looks new, it is unlikely to be an antique. Inspect the eyes of the decoy. 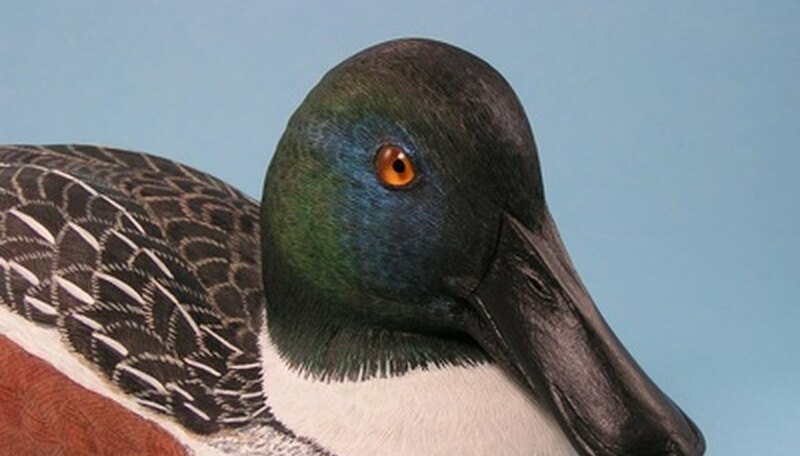 Vintage waterfowl decoys often have glass eyes. Check the bottom of the decoy. Some carvers carved their initials and date the decoy was made into the bottom of the decoy. Factory-made decoys almost always have this information stamped onto a metal tag on the bottom of the decoy. Study respectable books on the subject of duck decoys to learn to recognize an antique when you see one. In the “Wildfowl Carving Magazine spring 2010 article “The Real Deal, Stephen O’Brien of Copley Fine Art Auctions in Boston recommends three books in particular: "American Bird Decoys" by William J. Mackey Jr., "Wild Fowl Decoys" by Joel Barber and "The Art of the Decoy" by Adele Earnest. Identifying vintage waterfowl decoys is an art form in itself. To truly learn about these historical pieces, attend decoy auctions and hunting shows. There you will find many decoys that you can inspect to learn what subtle characteristics to look for in ducks made by pre-modern carvers. How do I Identify the Original Dazey Churn?